Now there is a Stitch Fidget Spinner for everyone that likes something in there hands. 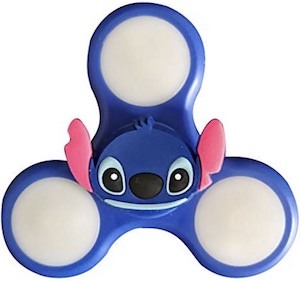 This fidget spinner is blue in color just like Stitch from the Lilo & Stitch movies and it has white parts on every spoke and in the middle where you hold the spinner there you find the face of Stitch complete with his ears sticking out. And this fun spinner is not just great looking in the light but at night you can turn on the build in light that has fun colors and makes spinning it extra fun. Now you can have something todo when ever want as the fidget spinner is always ready to spin for you. If you are looking for an amazing fidget spinner then you should get this Wonder Woman fidget spinner. We all know what fidget spinners look like and this Wonder Woman one looks like most of them shape wise only this one is decorated in the female superhero style. The ends are blue with white stars and the going to the center it is yellow and the middle part is red with the famous Wonder Woman logo on it in yellow. And as you can see on the picture the spinner looks amazing when you give it a spin with the yellow blue and black make it just something you want. 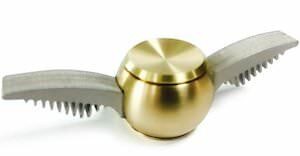 Now there is a Harry Potter fidget spinner that looks like the Golden Snitch. So if you like you Quidditch and Harry Potter and would love to have something to fidget with then this is the fidget spinner you want. If you look at the picture you notice that it does not really look like the Golden Snitch but click on the picture to see the fidget spinner in action because when it spins it really does look like the Golden Snitch and it will feel like it is flying in your hands. Fidget spinners are here to stay and this nice metal spinner is amazing for every Harry Potter fan.